EVO is a next generation brush-on gel system that has been designed from the base up with nail HEALTH and SAFETY in mind. EVO is ideal for those who care about their nail health and are tired of the damage experienced by other brush-on gel brands. Developed from the base up to provide a combination of performance and safety, EVO boasts a world first MEDICAL GRADE formulation and OXYGENATING gel technology that helps prevent dehydration and softening of keratin, and aids in protecting the natural nail from damage. All EVO Gel’s are also VEGAN, animal cruelty FREE, and “5 Free” NON TOXIC. EVO has a unique microscopic structure that has been specifically designed to mimic the nails natural process of moisture movement. 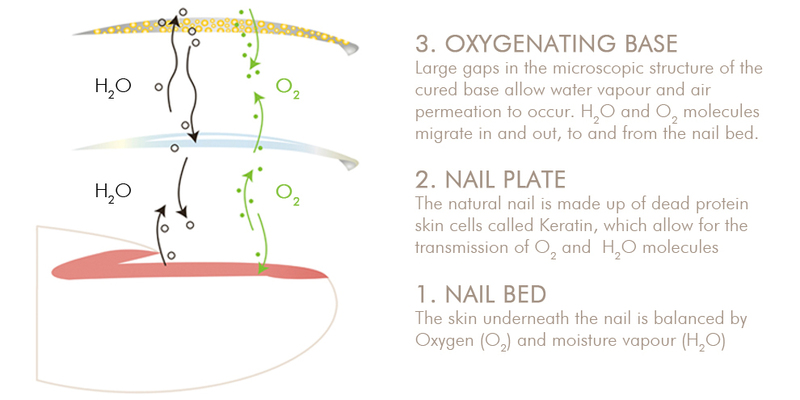 This movement allows oxygen and water vapour to freely flow to and from the nail plate, and helps the nail retain a balanced level of moisture and improved level of health. EVO Base is infused with Vitamin A and Vitamin E and these Vitamins migrate to the natural nail after curing.